Four Exeter university students from the UK will fly to Russia next month in a bid to show the UK is the best in the world when it comes to building apps. The youngsters, all aged between 20 and 23 form the only British team taking part in the Microsoft Imagine Cup World Finals, which aim to find the best app developing talent worldwide. Bizarrely, the foursome came up with the idea for their app during a caffeine-fuelled 2am ‘disco break’ while taking part in an event organised by SETsquared and the University of Exeter Students’ Guild. They have been having intense training from the university partnership ever since to prepare them for the world cup. SETsquared, a partnership of the universities of Bath, Bristol, Exeter, Southampton and Surrey, has given the team business mentoring through its partners, put them in touch with high profile mentors for one-to-one advice and even flown them to MIT in America to get tips on becoming successful technology entrepreneurs. The training has certainly paid off for the student start-up that goes by the name of ‘Colinked’, securing a £10,000 business loan from Creative England and an offer of a place within SETsquared’s technology business incubator scheme. Colinked will pitch its app live on stage in St Petersberg in early July as part of the Microsoft Imagine Cup in a bid to win the $50,000 top prize. 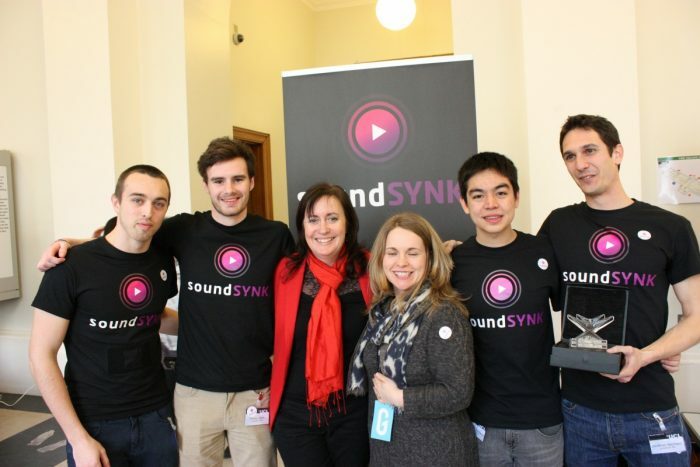 Colinked’s app is called ‘SoundSYNK’ and uses innovative technology to allow multiple phones and devices to join together and play the same song simultaneously, effectively creating a symphony of speakers. SoundSYNK Co-founder Edward Noel, 20, said he could not quite believe the success of the app, considering its humble beginnings. “The whole idea came about during a moment of frustration, which is incredible really. We were taking part in this SETsquared event at the University of Exeter Students’ Guild where we had to think of and create an app in 48 hours solid. It got to about 2am and we couldn’t think of what to create so thought we’d take a break and put some music on our phones. We were Caffeine fuelled and desperate for a strong idea to win the regional heat. After many different ideas we fell to the aid of music to inspire us. Little did we know this would be the future of an amazing adventure. “We were playing ‘Sweet Nothings’ by Calvin Harris on Alex’s laptop and it was just not loud enough for our liking. Being students we wanted to have a little rave but the volume was not sufficient. At this point we did the age old technique of lining up all of our phones, laptops, tablets and trying to play the song at the same time. Due to our lacking timing skills it failed miserably but caused us to instantly realise this is a great idea! Since then the quartet of coders and budding entrepreneurs have had a whirlwind four months of juggling the fledgling app business with their studies. While visiting MIT courtesy of SETsquared and Exeter Students’ Guild they landed a meeting with Echonest, which works with music giants such as Spotify and MTV, and are planning a partnership with the firm. Other UK organisations that have supported the youngsters are the Exeter Innovation Centre, Exeter Students’ Guild, the university’s College of Engineering, Mathematics and Physical Sciences, the OpenMIC network and technology companies Opposable Games and Applingua. SETsquared’s partnership director, Graham Harrison, said: “We had great belief in SoundSYNK from the outset. They had a strong idea and, with our guidance, have turned it into what could be potentially a highly-profitable business with a sustainable future. “Anyone can build an app to a certain degree, but turning it into a successful business, as these students have done, and making the most of the world’s booming app market is another thing entirely.